VELUX sun tunnels for flat roofs are designed to provide natural light into corridors, stairwells, bathrooms and cupboards, under pitched roofs, where installation of a VELUX roof window is not possible. Flexible sun tunnels are used when the distance between the roof and the ceiling is too small for a rigid tunnel. 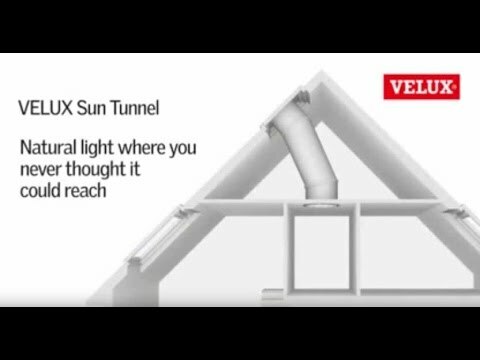 VELUX recommend the flexible sun tunnel for lengths from 0.2m to 0.9m between the roof and ceiling. What are VELUX sun tunnels? VELUX sun tunnels are a stylish way to transform your home, flooding rooms with tons of natural light and creating an air of space and freshness. Most houses have rooms that struggle to receive enough daylight, creating spaces that feel cold and unwelcoming until you turn on a light. VELUX sun tunnel skylights are the perfect antidote to this dim, dark problem. And they're easy to fit! Depending on where you will be installing your VELUX sun tunnels, it's worth considering whether you need flexible or rigid tubes. VELUX flexible light tubes are great for awkward roof spaces, and working around obstacles. However, a VELUX rigid tube will deliver more overall light into your room, with a super reflective coating allowing for 98% internal reflection. What are the features & benefits of them? Due to the way they flood a room with light, VELUX sun tunnels are an incredibly cost effective way to brighten up your home - saving you from having to switch on lights and use electricity to brighten dark or windowless rooms. Due to its dark coloured, flat, square frame and flashing in polyurethane with clear, robust glass, the VELUX sun tunnel fits in perfectly with any roof, in the same classic style as VELUX roof windows. The attractive diffuser unit sits seamlessly in the ceiling, spreading soft and restful light throughout the room. We can deliver the VELUX TCF 0K14 1010 14" Flexible Sun Tunnel For Flat Roof next day on our own vehicles, enter your postcode to see if you are in our servicable area.